Estrogen dominance describes a condition where you can have normal or excessive estrogen, but have too little progesterone to balance estrogen's effects in your body. An important cause of low progesterone occurs when the follicle does not release the egg. The follicle becomes a cyst and the normal progesterone surge does not take place. The lack of increase in progesterone signals the hypothalamus to produce more LH and FSH, which stimulates the ovary to make more estrogen and androgens, which in turn stimulates more follicles toward ovulation. If these additional follicles are also unable to produce a matured ovum and make progesterone, the menstrual cycle is dominated by estrogen and androgen production without progesterone. This failure to ovulate contributes to a condition called "estrogen dominance." Women with PCOS (polycystic ovarian syndrome) frequently do not produce enough progesterone. An increasing number of researchers suspect that "environmental estrogens" are contributing to hormonal imbalances. Estrogenic petrochemicals are pervasive in our air, food and water. They include pesticides and herbicides (e.g., DDT, dieldrin, heptachlor, etc.) as well as various plastics (polycarbonated plastics found in baby bottles and water jugs) and PCBs. At least 50 environmental hormone mimics have been identified. Tens of thousands of environmental chemicals have not even been tested for their effect on your hormone function. These estrogen-mimics are highly fat-soluble and are stored in your fatty tissues. They are not biodegradable or easily excreted so they simply accumulate in your body. For example, most women have detectable amounts of DDT residue. These chemicals mimic natural estrogen or other hormones and are taken up by the hormone receptor sites in your body, thus interfering with natural biochemical activity. Another possible factor is that your body may have an impaired ability to metabolize and dispose of estrogens. This could be the case if you have impaired liver function or constipation. If you have any of the above symptoms, consult with a licensed naturopathic doctor or MD in order to determine whether you have a chronic hormonal imbalance. Which Is Better for Balancing Estrogen in PCOS - Soy or Flax? Phytoestrogens are plant substances that have biologic actions in your body similar to estrogen, although much weaker. They are abundant in flax seed and soy. You've probably heard that eating soy may reduce or "balance" your estrogen. If you are consuming soy foods for this reason, you may want to consider flax seeds. A study conducted at the Department of Nutritional Sciences, University of Toronto compared the effects of consuming flax seed versus soy on estrogen metabolism in 46 postmenopausal women. In the flax seed group, urinary concentrations of the 2-OHE1 estrogen metabolite, but not 16alpha-OHE1, increased significantly, suggesting that 2-OHE1 levels increased relative to 16alpha-OHE1. In the group who ate soy, there was no change. An optimal balance between 2-OHE1 and 16alpha-OHE1 is a key to good health and may reduce your risk of cancer. A substantial proportion of women have too much 16alpha-OHE1, which leads to problems such as breast cancer. If you have a high level of total estrogen, it's possible that you are also producing too much of the 16alpha-OHE1 estrogen metabolite. So adding flax seeds to your diet may be a good idea. Flax seed provides significant fiber and mucilage for proper bowel function. This fiber helps to reduce cholesterol by holding it in your bowel to be eliminated regularly. 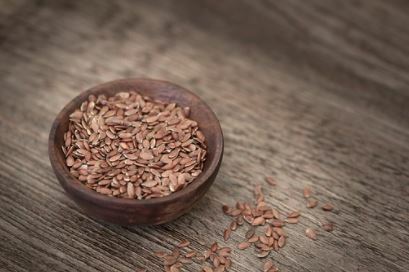 Flax is also quite high in omega-3 fatty acids, which are beneficial to women with PCOS. We suggest you buy fresh flax seeds and grind them up in a coffee bean grinder. Put the ground-up seeds on your cereal, salads, and other foods. Or add them to soups, casseroles, etc. Try 1-3 tablespoons of freshly ground up flax seeds daily. It is important to drink 8 ounces of water for every tablespoon of flax seed you take each day. Source: Brooks, JD et al, Supplementation with flaxseed alters estrogen metabolism in postmenopausal women to a greater extent than does supplementation with an equal amount of soy, Am J Clin Nutr, 2004, 79(2):318-25.